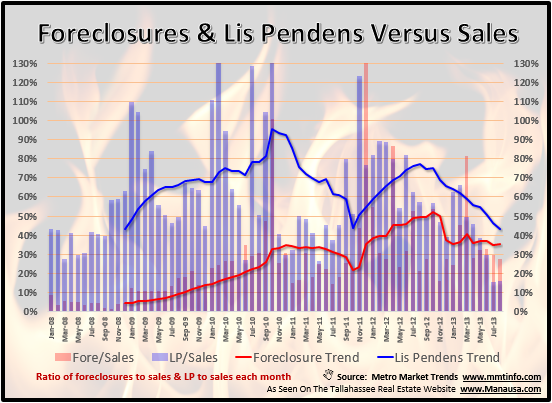 New lis pendens filings in Tallahassee fell 33% in January when compared to January 2013, and foreclosures rose significantly up 92%. The continuing decline in new lis pendens filings is exciting, and the rapid rise in foreclosures looks to be a stronger move by banks to resolve the lingering non-performing loans. The blue line in the graph below shows that nearly 112% of all filings are ending up in foreclosure sale, indicating that foreclosure sales have exceeded new lis pendens filings and that the future rate of foreclosures will eventually be on the decline.